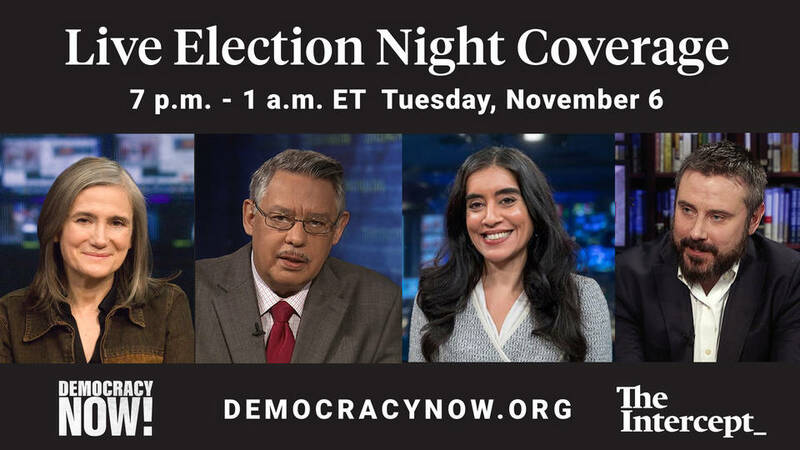 Midterm 2018: Live Election Coverage From The Intercept And Democracy Now ! Two days ago where we left off, the initial portion of the caravana which was about 800 people strong split in two parts in Veracruz after not receiving the 150 buses/trucks promised to them by the Governor to get them safely through one of the most dangerous treks of their journey to Mexico City. It was a bold move by the Governor - but had to be cancelled due to the water outage in Mexico City (which is only now being resolved). The caravana split in two groups; and as Proceso first reported,100 of them went missing after hitching a ride in two trucks. Since then, thousands of the migrantes have made it to Mexico City, but there is worry over the initially reported missing 100. Most news agencias have picked this story up, some have reduced the number of missing migrantes to 80. Zeta's Carlos Alvarez reported this yesterday and kept the number missing at 100. The hope is of course the missing ones will be accounted for, yet in the back of everyone's minds are darker thoughts and despair. OAXACA, Oax. (Proceso.com.mx) .- "We are in the middle of an emergency," said the human rights defender of the People of Oaxaca, Arturo Peimbert Calvo, confirming that since Saturday November 3 are reported as missing around 100 exodus migrants who boarded two trucks in subhuman conditions. For the time being, the office of the UN High Commissioner is already aware of the case "until we know of his whereabouts they continue to be disappeared". He said that the Central American migrants boarded some trucks in the City of the Island in the state of Veracruz and although "we were insisting that they not go up and denouncing it, but the absence of the State, of the surveillance, of everything, is what has made today are missing. " For now, they are tracking if the disappeared traveled in two trucks, one with plates 183-EC-3, without distinguishing what state it is, and another with plates KY-88-765 of the State of Mexico, which they boarded the migrants despite the conditions in which they traveled. It is worth mentioning that Oaxaca's defense staff continues with the accompaniment of the exodus of migrants in the absence of the State. " MEXICO CITY (APR) .- The federal government ignored the request of civil society organizations to activate a national emergency to serve the thousands of members of the migrant exodus, most of whom are currently in the sports Jesus Martinez "Palillo ", From the Magdalena Mixhuca, in Mexico City. The Sin Fronteras organization noted that, despite the efforts of the capital city government, the mayors' offices and civil society organizations, "they have many shortages and urgent needs for basic hygiene, medical, food and civil protection services, as well as problems in coordination and civil protection ". Therefore, the federal government called to activate humanitarian aid and emergency protocols, insisting that "there is fear for the life and health of the most vulnerable people such as children, adolescents and seniors who are part of this collective". On October 31, five organizations handed over to Alfonso Navarrete Prida, the Secretary of the Interior, a request to notify the National Emergency Committee about the situation of Central Americans, but Sin Fronteras said that "so far they have not received any response On the contrary, the harassment and aggressions by the federal forces continue, in addition to the direct threats to human rights defenders who seek to help these people. " Locally the drug war continues, I'll be back with the recent reports ...after the election. Well we're not out of the woods, the Republicans actually gained seats in the Senate (which is bad news) and it was a close call in the House - too close for comfort. 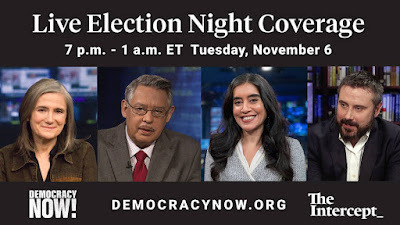 But as Allen Nairn said during the round table discussions, "..the Democrat's House win, even though it was close, is going to give us a little more time before the nation becomes a complete fascist state." Thanks Allen. I think we're already there.